5. Boucher de Perthes, Jacques (1788-1868). Antiquités celtiques et antédiluviennes. Mémoire sur l'industrie primitive et les arts à leur origine. Paris, 1847-1864. Boucher de Perthes was a French customs official and amateur antiquarian. 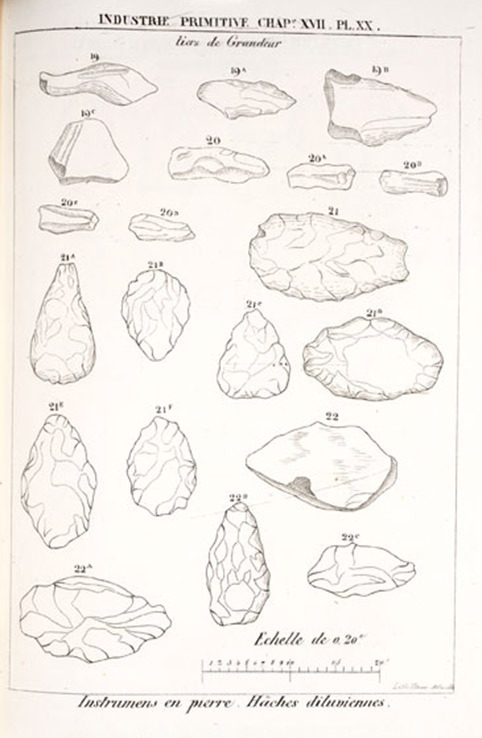 In the 1830s, Boucher de Perthes began collecting palm-sized pieces of flint in the vicinity of his home town of Abbeville, in northwestern France, and he came to believe that they were human artifacts—stone tools made by prehistoric peoples. In 1847, he published the first volume of his Celtic and Antediluvian Antiquities and presented his case that humankind went much further back than the era of recorded history, and that these human ancestors used stone tools before they invented metal ones. Practically no one accepted his argument, primarily because his flints were without context--unassociated with human or animal remains. 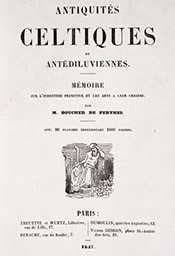 Boucher de Perthes lived long enough to see his conclusions vindicated in 1859.